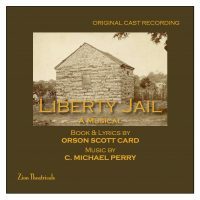 At the end of the persecutions of the Mormons in Missouri, Joseph Smith, Hyrum Smith, Sidney Rigdon and three others were imprisoned in a jail at Liberty, Missouri. The conflicts that arose there and the friendships that were formed shaped the future history of the Mormon Church — and also brought to Mormon Scripture the beautiful and poetic Section 121 of the Doctrine and Covenants. This musical drama will have your audience totally involved with beautiful music, a deeply moving story and a variety of characters. It will be seen that there sometimes, for a Prophet of God, can be liberty in jail. “Absorbing, moving … a powerful drama … powerful music.” PROVO DAILY HERALD. “A Mormon classic! The score is lyrical and sometimes thrilling.” UTAH HOLIDAY MAGAZINE.